This might seem an obvious choice since I've been giving Macross a huge reach around for the past couple of months, but at the same time it seems like a crime that I haven't focused more on one of the main aspects of Macross: the music. I did talk a little about Yoko Kanno and her contribution to the series, but if you watch Macross Frontier there is one defining musical voice of the show, and that is the singing voice for Sheryl Nome, May'n. 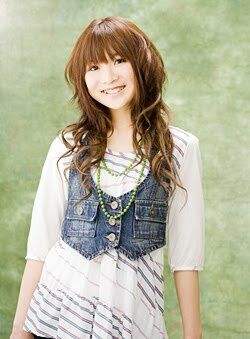 Born as May Nakabayashi in 1989 (must be a good year for producing future Idols), May'n had her first big breakout song in 2005 with the hit, Crazy Crazy Crazy. Since I don't live in Japan and haven't followed her career that closely I can't for sure say that she wasn't as big as she is now after being chosen to be Sheryl's vocals, but I have a feeling she owes a lot to Macross. Personally, her voice took me a little while to get used to. In MF she sings in English a lot, and her English isn't very good at all. But once I got past that I realized she has a very unique sound, and defiantly doesn't sound like every other J-Pop idol flooding the market right now. My favorite song she performs in Frontier I highlighted in the Kanno article, "Welcome to My Fanclub Night SOS" and it is still one of my favorite anime tunes to date. I think it is the fact that you can really hear the passion in her voice is what I like about her. It's the perfect voice for a show with a strong music presence because you are almost guaranteed to be in tears at some point in the show with her music playing along with a sad/happy scene.